An average chicken has 8,500 feathers. That makes for a warm coat. Like her wild bird cousins, a chicken will fluff up, trap air under her down, and stay cozy, even in below freezing temperatures. However, a sharp, cold wind that ruffles the feathers can sent a chill to the skin. Icy rain on a hen’s head and mud frozen on legs can chill her to the bone. So, although that fine-feathered garment can keep a hen plenty warm even in the coldest weather, there are some things to do to keep your chickens comfortable and healthy in the winter. Chickens do not need insulated houses. (Although coops in extreme temperatures, like those found in North Dakota and Alaska will benefit.) But, poultry do need shelter that is out of the wind and free of drafts. At the same time, it shouldn’t be at all damp. Manure contains a lot of water, and in the winter, when the coop is closed up, this can make the air unhealthy and the hens prone to respiratory illness. 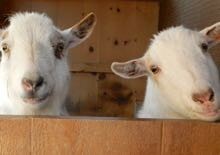 I keep my coops shoveled out weekly and bedded with fresh pine shavings. Also, good ventilation is a must – it’s best to have vents high near the roof. Most chickens do not need heat lamps. In fact, if you have a spot heater in the coop, the hens will huddle near it, but when they move away to eat or to roost, they won’t have their feathers fluffed out, and they’ll be cold. It’s not good for them to go from one extreme temperature to another. So, you can keep the coop closed and heated, or totally unheated. If you have only one hen, do her a favor and get another. They need to huddle on the roost with each other to stay warm at night. A few breeds are not cold-hardy. Silkies and frizzle-feathered birds can’t stay warm in a winter wind. Also, their feathers don’ t shed water and so it is lethal for them to get wet and damp in the winter. Standing in mud can kill them. 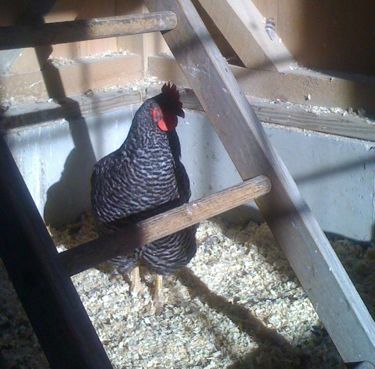 It’s best to provide Silkies with spacious, dry, ventilated indoor housing for the winter. 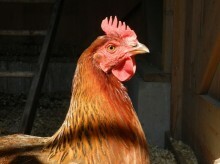 Also, some hens, and more often roosters, have big combs, prone to frostbite. Slather on some vaseline if you know the temperature is going to drop. Chickens appreciate a bright and sunny coop. Here’s my aged Eleanor, who has claimed a toasty place in a patch of sun. In the winter, sunlight ebbs and some people chose to use a lightbulb in the hopes of increasing egg laying. I’ve written a post about that here. Chickens need to be high and dry. If your run gets muddy, dump in a few bags of coarse sand to give the hens a place to roam above the muck. Outside roosts are welcomed by the flock. I also give mine some logs to stand on. Chickens have scaly, bare feet. They don’t like walking on snow or ice. They’ll do it, but they won’t be happy. So, take a moment and shovel a clear area for them in their run. If the snow is too deep and icy, put down some hay. 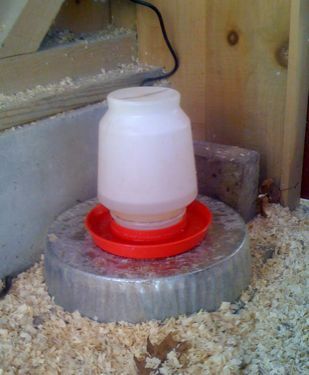 One of the most important things to give your chickens in the winter is fresh water. If you have electricity in the barn, get one of these base heaters for the waterer. In the winter, chickens will expend extra calories staying warm so give them an added ration of cracked corn or scratch grains. Also, if your hens free range in the summer and eat lots of bugs (protein! ), be aware that their diet changes in the winter, when all of their nutrition comes from you. Make sure you’re feeding them high-quality laying hen pellets. Greens are important in the winter as much as in the summer. 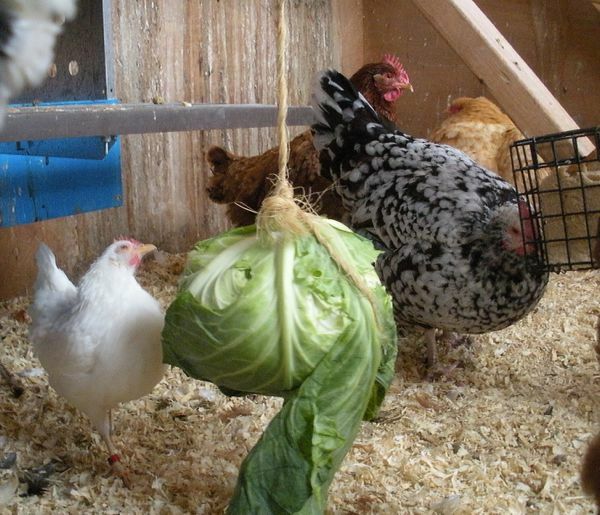 My girls get bored all cooped up, and so I hang a cabbage in the pen. They peck at it (they do like a rousing game of tetherball) and so don’t peck at each other. The added benefit is that they’re eating greens. I also put treats in a suet holder installed inside the coop. Hens need 14 hours of sunlight to lay. You can increase the light using a 40 watt bulb on a timer, and you’ll bring production up. (However, they still won’t lay as much as in the summer.) I don’t use a light because it only makes a difference with pullets – your older hens will be molting the first part of the winter and will need a rest until February, when they’ll start laying again, anyway. If you do decide to use a light, turn it on in the early morning. Do not use it at night – if it’s dark out and the light suddenly goes off, the hens won’t have a chance to settle into their roosts for bedtime. They’ll be miserable stuck on the ground. There are usually a few weeks here when the temperature doesn’t rise above 0 degrees F. Each morning I hurry to check on them. The wind will be biting. I get chilled making my way across the icy, snowy yard to the coops. My eyes water from the cold. I expect to find the girls frozen stiff, but they’re fine. I toss them some grain. They look cheerful. It’d be nice if they worried about me as much as I worry about them.